The outlook for the world economy has improved in the course of 2010 and the recovery has gained strength in the EU as well. The Central, East and Southeast European countries (CESEE) have also recovered from the crisis; the majority of them recorded positive GDP growth. On average, the recent revival of exports has been even stronger than their growth before the crisis. By way of contrast, the trends in industrial output have so far remained more or less flat. The persistent decline in construction and fixed investments – both related to the still hesitant credit markets – represents one of the key downward internal risks to our moderately optimistic regional economic forecast. 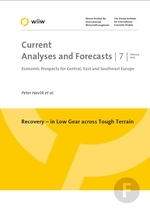 The general outlook for the CESEE region in the baseline scenario reckons with a gradual strengthening of economic growth over the period 2011-2013, in most cases rarely exceeding 4% per annum. GDP growth will become more broadly based. The formerly predominant role of external demand will weaken somewhat, while both household consumption and gross fixed investments will ultimately contribute positively to GDP growth. With exports, industrial output levels and eventually also GDP growth having already recovered, the economy is seen as having largely returned ‘back to normal’ – yet with at least two important differences: (1) post-crisis growth will be slower. That slower growth, however, also implies that (2) the labour market situation will be ‘very far from normal’ as unemployment will remain high, with young and low-skilled workers being especially adversely affected, and any improvement only gradual and delayed. Inflation rose throughout 2010 as food and commodity prices soared; in general, however, it will pose no (or little immediate) threat. The moderate economic upturn and a revival of capital inflows have resulted in renewed appreciation pressures. The forecasts point to a gradual deterioration of current account positions in all CESEE countries, yet the return (or persistence) of extreme imbal-ances are only expected for Montenegro, Albania and Serbia. The financing constraint with respect to both domestic and external loans will constitute one of the key brakes on future economic growth. Given the sorry state of public finances and the ensuing budget consolidation efforts, we cannot expect any new additional growth-stimulating measures from the public sector – on the contrary, owing to the limited fiscal space government deficits and public debts will be scaled back. The sharp drop in GDP in most CESEE countries during the crisis resulted in both absolute and relative declines in their per capita GDP. The catching-up process of the previous decade was thus interrupted and income gaps vis-à-vis Western Europe widened. In the baseline GDP growth sce-nario wiiw reckons with a renewed catching-up process starting as early as 2011 (after losing 5 to 7 years in terms of income convergence).